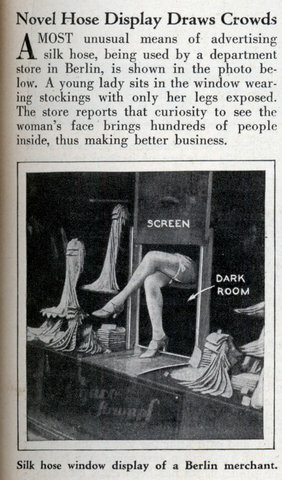 A MOST unusual means of advertising silk hose, being used by a department store in Berlin, is shown in the photo below. A young lady sits in the window wearing stockings with only her legs exposed. The store reports that curiosity to see the woman’s face brings hundreds of people inside, thus making better business. I bet 95% of the men watching those legs could care less about her face.